YES! It’s true… I am now a Certified A Muse Instructor! I attended training in Seattle last weekend and got to meet most of the FABULOUS A Muse Instructors at the A Muse Artstamps Headquarters. I’m thrilled to join the A Muse Creative Team and I hope to spread the love of stamps throughout Newfoundland & Labrador. If you live in the area and are interested in card making you should definitely sign up for some fun classes – I will be teaching classes every month at The Paperie in St. John’s, where I’ve been a store manager for over 4 years. My first “official” class as an A Muse Instructor is listed below – hope to see you there! Join me – The Paperie’s very own official A Muse Instructor, for my last Christmas Card Class leading up to the big Holiday. 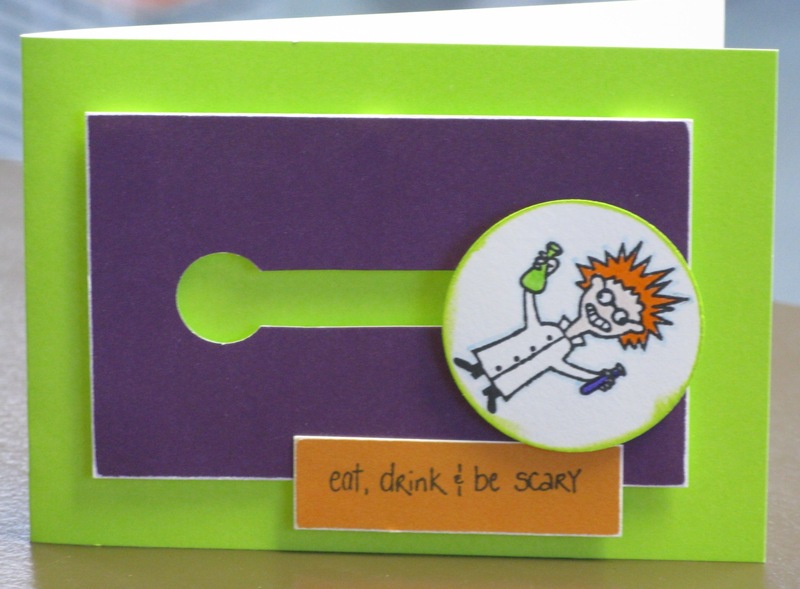 This class will feature three beautiful card designs that will be quick and easy to mass produce for those of you in a time crunch, PLUS one “snazzy card” inspired by a class Julie Ebersole taught in Seattle. We will stay true to the A Muse Artstamps motto: Think Simple. Think A Muse, focusing on their clean, classic style! This class is great for stampers of all levels, even those who are just starting out! Me and Julie Ebersole at the A Muse shop. 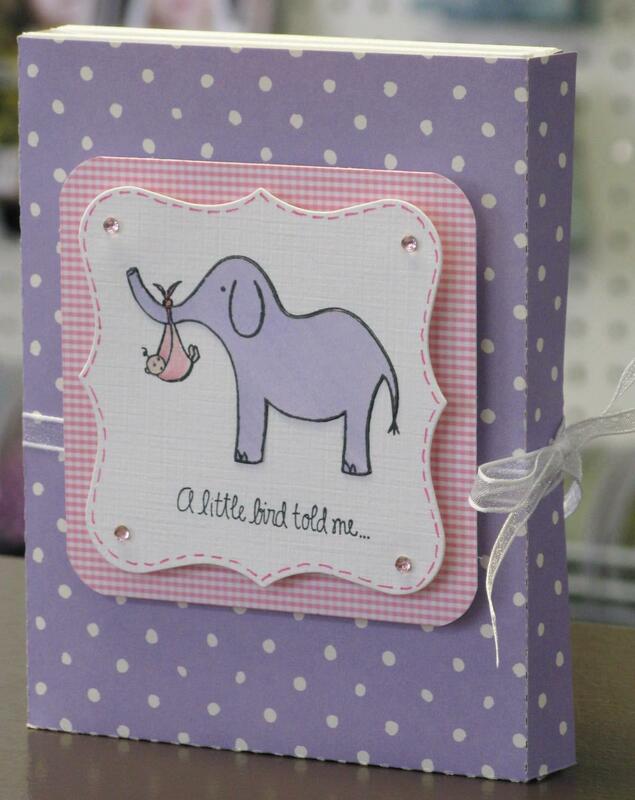 A Muse Stamps used: Elephant & Baby and Little bird told me. 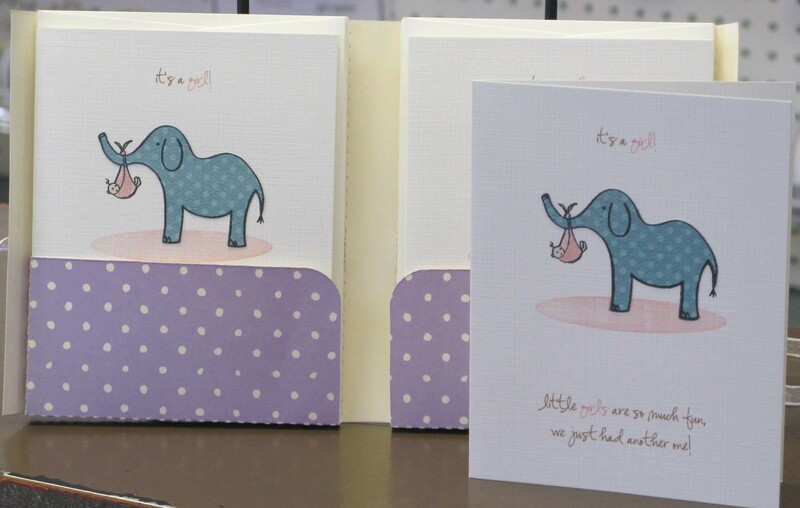 This was a really easy project thanks to the AccuCut Card Portfolio die-cut – I cut a few corners by using the printer to print both the inside and outside of the annoucements, as seen below. I used the A Muse Kitchen Purple and Gingham pink papers for the portfolio, as well as A Muse twinkle stickers and ribbon. A Muse Stamps Used: Crooked House, Tiny Witch, Parade, Happy Trails. 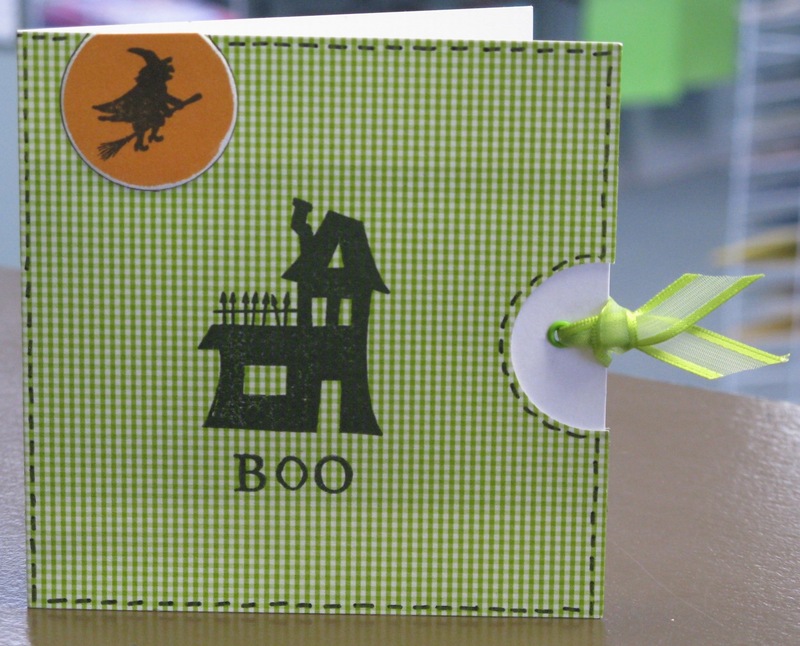 When I was doing the ordering a few weeks ago I totally messed up and forgot to order the new A Muse “Boo” sentiment. It would’ve been absolutely perfect for this card because of the nice bold font – most of the sentiments I had didn’t show up on the green Gingham paper. I ended up using an acrylic alphabet set to spell “Boo” which turned out okay, but still wasn’t quite what I had envisioned. 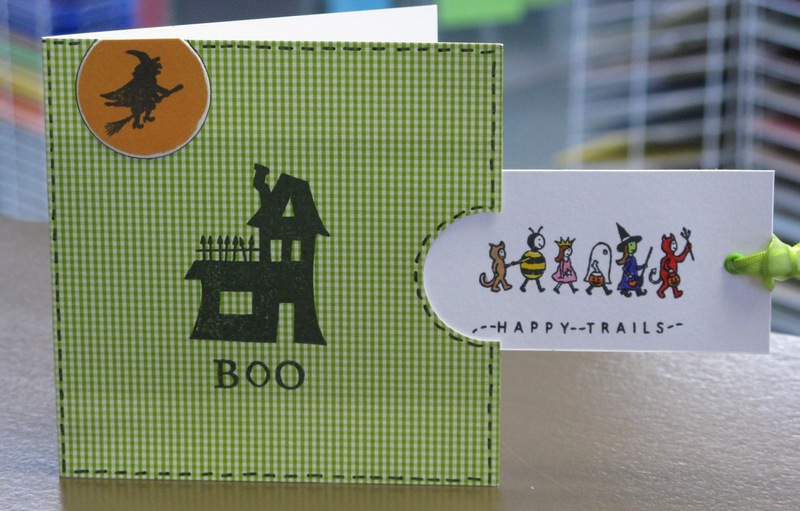 The Happy Trails stamp worked out great with the little Parade of costumed kiddies – love that stamp so much! 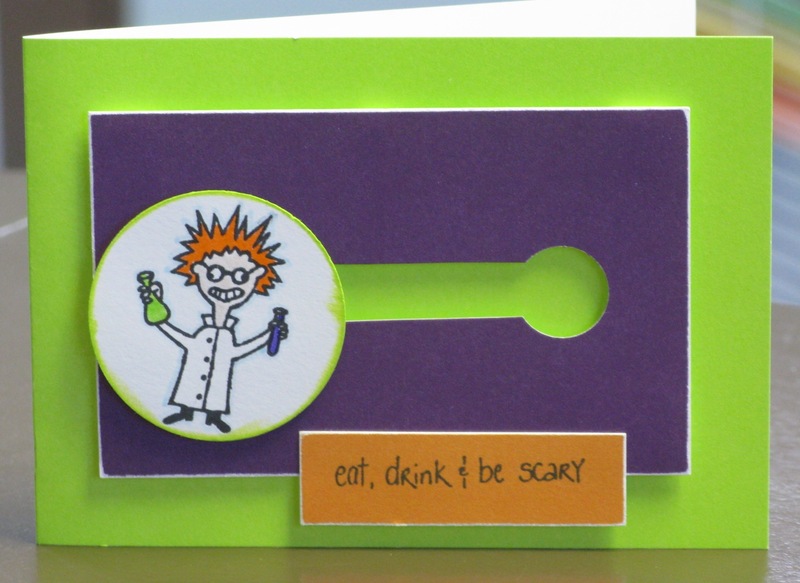 Here’s another card I made for the aforementioned class…. A Muse Stamps used: Flourish frame, Bride & Groom, Congratulations MA. I saw this Flourish frame on a sample that A Muse sent to The Paperie and I knew I had to have it. The stamp is actually half of a frame so you can make your frame as wide as you like – or use it alone as an accent. Gotta love versatility like that! 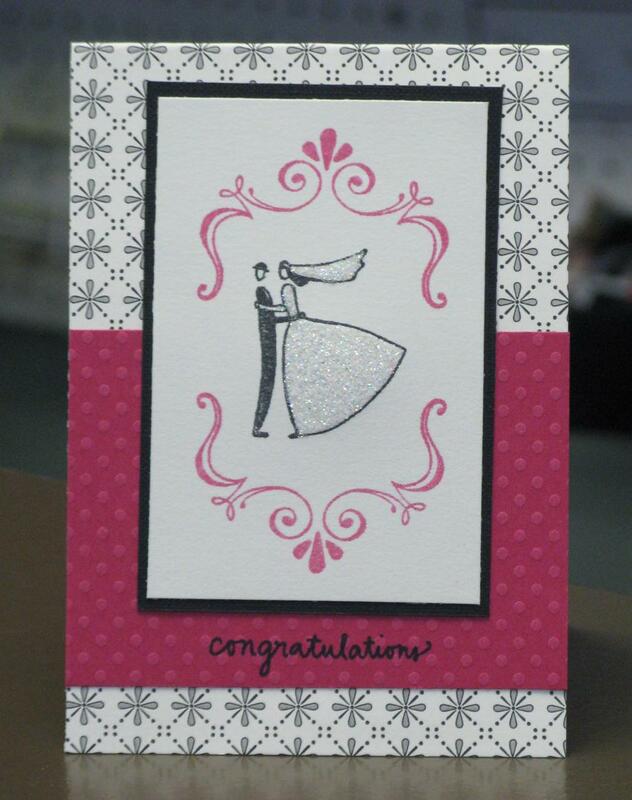 The Bride & Groom is one of my go-to stamps for almost every wedding card I make. I am a big worrier when it comes to repeating the same images on cards that are for the same people – that typically won’t happen for a wedding card, but for birthday’s and Christmas it’s nice to know who got what. For the last three years I have promised myself that I would make a book of my stamps so that a) I would know which ones I have (not that I could ever forget, each one is like a child to me) and b) I could record who has received what images. Basically, the idea is to have an index card for every three stamps with the image/words and name of the stamp on it, then put the name of the people who have received a card using those stamps on the back. I started to make this book once using a 4×6 photo album and I hated it so I gave up. I think the only way is to make one from scratch – I should really get started on it soon because as my stamp collection grows it becomes an even bigger undertaking. My goodness, I’m rambly today… since the theme of this blog entry is Congratulations, it seems only fitting to congratulate… MYSELF! *hehe* My card for the A Muse “No Coloring Zone” Challenge made it to the A Muse Challenge Round-up on their Blog! YAY! I also had some projects featured over on the AccuCut blog on Thursday – pretty exciting stuff! I can’t wait to celebrate Thanksgiving with the family tomorrow, this has been such an incredibly wonderful month and I truly do have so much to be thankful for. Hope everyone is having a great weekend!